Jasmine Stauffacher Gray won four races at the Husky Invitational on Saturday. 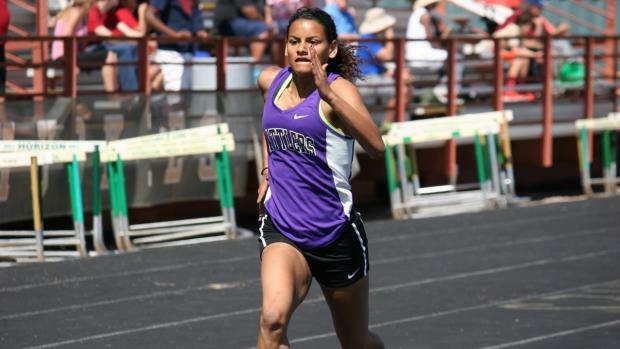 Arizona Milesplit Photo. It was a warm day at Horizon High School on Saturday, but the track was even hotter. Shoot, I am still not sure if my bright red burned legs are from the heat of the sun or the heat from the track. The 400m dash races, just like at the AMDG Invite the night before, turned out to be blistering. Three time state champ Jasmine Stauffacher Gray easily dispatched the girls field. “My coach has splits for me depending on where I am," recounted Jasmine, “I just wanted to get to the split, open up and stay strong." She certainly stayed strong winning the 400m, 4x100m, 4x400m and 200m races. Scary thing is one might argue she didn't event run one of her best events, the 300H. She likes both races but for different reasons, “I really like hurdling because it is strategic and I like the 400m because it is competitive, it just depends on what mood I am in." The 400 is certainly competitive in the state of Arizona. It will be interesting to see how she fares against Chandler's Anna Foreman and Highland's Alena Ellsworth next week in the 400m at the Chandler Rotary. The boys quarter mile race was also very quick. Sandra Day O'Conner's Oscar Mills won the race in 49.58, though he was challenged early on by Horizon's Maj Williams who finished 2nd in 50.28. This performance was especially impressive since Oscar has only been able to run for one week in practice due to a nagging hamstring injury. “It feels good to be out there," explained Oscar, “I just wanted to feel it out, make finals and hopefully do well there." If winning is doing well he certainly accomplished both of his goals. Hopefully Oscar will continue to improve as his hamstring returns to full strength. While Maj missed winning the gold medal in the 400m, he was able to secure a top finish in both the 100m and 200m, clocking times of 11.23 and 22.81. Even in the short sprints Maj was challenged by Eagles. Sandra Day O'Conner had three finalists in Terry Griggs, Estefon Marrero, and Solomon Enis. Not surprisingly the same three guided them to 4x100 victory in 43.49. That mark provisionally qualifies the Eagle 4x100m for the state meet in May. The Sandra Day O'Conner 4x400m also put together a strong team, besting the field by almost 8 seconds to finish in 3:24.49. Their 4x400m time is also a provisional qualifying mark. The Rattler girls did not want to mess with provisionally qualifying in the 4x400m though. Behind 800m winner Drianna Mustin and Jasmine the harriers from North Canyon were the class of the field, besting Cactus Shadows 4:02.82 to 4:12.21. Their performance came in under the division 1 automatic qualifying time of 4:04.31. Look for that squad come May 9th, it would not be a surprise to see them on the podium at state. As cross country fans from last fall remember the Gila Ridge boys teams came out of seemingly nowhere to win the division 2 state title. This spring their 4x800m team will not be sneaking up on anyone. Despite missing the automatic state qualifying time by less than half a second, senior anchor Robert Rillamas was pleased with his teams performance, “This shows we can go and compete over any distance." The team is motivated to work hard, not just to get the qualifying time either. Lead off leg Aldo Marquez explained, “Our goal is to win state." They should have their hands full with Catalina Foothills, but they are ready for it. “We will train harder and continue to improve," declared Robert. One of the most impressive performances of the meet came from Lara Yazzie of Page HS. Coming into the meet she wanted to finish in the top 5 and break 12:30 in the 3200. While she finished just over a minute behind winner Kelly Naumann of Corona Del Sol [Editors note: I was informed afterwards that Kelly set a school record at this meet], she set a PR by bettering her state time from last year by two seconds to finish in 12:21. One might ask what made the race so impressive if she finished 70 seconds behind the leader. The answer lies in how Lara ran the race. After the first lap Lara found herself in the back third of the race and the second lap wasn't much better. Usually this spells doom for a runner, but Lara knew what splits she had to hit and was not going to get sucked into going out to fast. Lap by lap she steadily moved up to finish 2nd. “My legs were dead tired," recalled a very cheerful Lara afterwards. It's probably fair for your legs to be tired after bettering your peak performance from the previous season. Speaking of bettering ones peak performances, Sam Shoultz just missed his lifetime PR of 6-8 in the high jump set last year at the Great Southwest Invitational. However Sam is already look passed just jumping 6-8, “I want to jump 7'0." Having punched his ticket to state, he can now focus on achieving that goal.